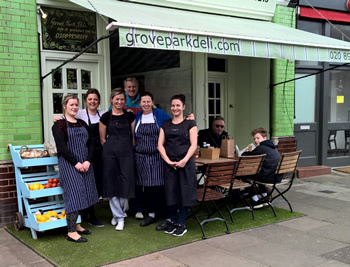 I am particularly proud of our team at the deli, many of whom have been with me for many many years and have proven themselves through the busiest times. "I’ve always had a passion for cooking and have enjoyed being a chef for more than two decades. I was lucky enough to develop my skills at many prestigious establishments, including 'Langans Brasserie', (where I was the first female chef) and at 'The Waterside Inn' at Bray (2 Michelin Stars). I learned a great deal from my time with Mr Roux. My knowledge of world cuisine was greatly enhanced by working in Sardinia and Klosters in Switzerland. I was also head hunted to open the restaurant '1997' in Hong Kong. We specialised in French, Austrian and Italian Cuisine and proved a great success, becoming a very popular meeting point in Hong Kong. One of the highlights of my career was working for two years as personal chef to Mr and Mrs Andrew Lloyd Webber. I catered for private dinner parties, business lunches and dinners, theatre first and last night parties and cocktail parties. I thoroughly enjoyed my time at '192' in Kensington Park Road, working with Angela Dywer, where my creative abilities were put to the test. 'Morton House Hotel' in Dorset is a beautiful Elizabethan Manor House. Within six months of taking over the kitchen, we achieved a listing in The Good Food Guide. My time as Head Chef at 'Muscat', a fabulous restaurant in Dublin, was hard work but great fun. It was an extremely popular restaurant and was recommended in both the Michelin and Dublin food guides. In 2003, my sister Annie, called me up to tell me that a local business was for sale, and in June I became the proud owner of the Grove Park Deli. I’m so pleased to tell you that we are going from strength to strength. Why not come along and take a look for yourself?"